When Europeans first came to these shores, they described a place of astonishing plenty. Oyster beds yielded plate-size oysters, the waters so teemed with fish one could net boatloads of them in no time, and the air was so filled with birds one could catch them in one’s hands. 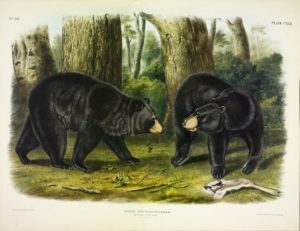 Black Bear (Ursus americanus), John James Audubon, Quadripeds of North America, 1847, v. 3, no. 29, plate 141. University of Michigan Library Digital Collections. 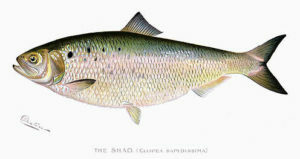 Early colonists described spring fish runs as so thick a man could walk across a river on their backs. 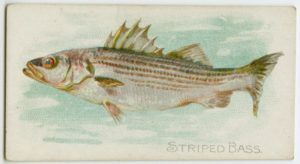 Striped bass, shad, alewives and other river herring — these were the fish that migrated by the hundreds of thousands from the ocean and crowded into our rivers and streams to spawn in fresh inland waters. The arrival of these esteemed food fish in spring seemed providential to settlers who had endured a long cold winter. The fish came in “such multitudes” that a spring without their arrival would have been unimaginable. In fall, the young of the year swam back to the ocean, where they would mature and begin the cycle anew. When Europeans first settled our region, they clear-cut woodlands, drained wetlands, and plowed grasslands into farm fields, uprooting the wild animals that lived here. (See the separate Woodlands, Grasslands, Waters, and Wetlands pages for accounts of these habitats.) When the new settlers moved in, wild animals migrated out or were pushed out. European domestic livestock were turned loose to graze and browse freely in fields, marshes, and woods. It was not long before other grazers and browsers such as deer, elk, bison, and moose migrated out. Over-hunting caused game birds to decline so drastically that by the early eighteenth century closed season was declared on them in New York (see the New York Birds page). 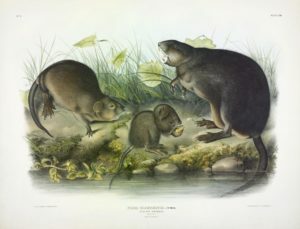 American Beaver by John James Audubon, Quadrupeds of North America, 1847, v. 1, no. 10, plate 46. University of Michigan Library Digital Collections. Hunting as it was practiced by the Europeans took a heavy toll on the wild animal population. 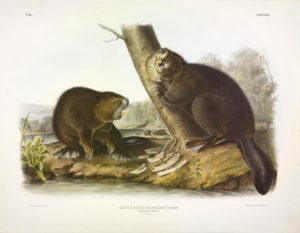 Fur-bearing mammals, especially, were heavily hunted; these included mink and otter, but beaver was hunted to near-extinction because of its high market value. Beaver pelts were esteemed for the manufacture of felt hats that were the fashion rage in seventeenth-century Europe; beaver testicles were believed to have curative powers; and beaver oil was thought good for “dizziness, trembling, rheumatism, lameness, and pain in the stomach,” to quote a contemporary account. European traders recruited Indians in the hunt, giving them guns in exchange for pelts. Within decades of the Europeans’ arrival, the beaver was extirpated from our region. 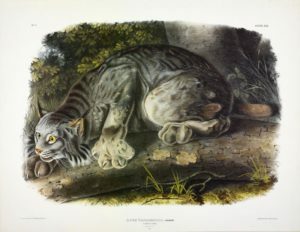 Lynx canadensis by Audubon, Quadrupeds of North America, 1847, v. 1, no. 4, plate 16. University of Michigan Library Digital Collections. Any wild animals that threatened European livestock were killed with impunity. Because wolves attacked their cattle in the woods, the colonists placed bounties on their heads. This monetary inducement led to the rapid eradication of wolves from the region. Also driven out were the lynx and cougar. None have returned to our region. According to John Waldman in Running Silver, construction of water-powered mill dams peaked between 1780 and 1860; by 1840, 65,000 such dams were tallied in the eastern US. alone. Dams do not kill fish but block their way to the spawning grounds, preventing them from replenishing their numbers. 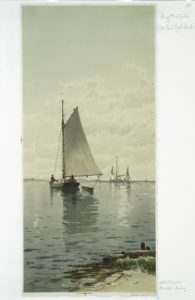 Credit: Alfred Thomas Bricher, “Blue Point Oyster Boats,” 1891. [Public Domain]. From the Digital Collections of the New York Public Library. Besides dams, centuries of pollution, overfishing, and over-harvesting have decimated marine fauna, from shellfish to finfish. Already by the mid-nineteenth century, wild oysters were gone from New York waters as a result of over-harvesting. Oystermen seeded old oyster beds with domesticated oysters, but their re-seeding methods depleted wild beds, and the cultivated beds became so tainted by raw sewage that a ban on commercial oyster and clam harvesting had to be imposed in the early twentieth century because people were sickening and dying from eating local shellfish. Pollution by raw sewage was also blamed for massive fish kills that covered New York’s bays (see the New York Waters page). The Great South Bay on Long Island’s South Shore had once been the mainstay of the US clam industry, with baymen harvesting 700,000 bushels, or half the nation’s supply, in the 1970s. By 2003, overharvesting and pollution combined to decimate the clam harvest by a staggering 99%. In the mid-2000s, the US Fish and Wildlife Service worked with a number of public and private agencies under the rubric of SNEP (Southern New England-New York Bight Coastal Ecosystems Program) to construct fish ladders over dams that obstructed fish runs, and even to remove dams and open up the waters again to anadromous fish. Nothing less than the removal of dams, insists John Waldman, will allow the anadromous fish to recover, although they will never reach their historical numbers. Since 2008, when they published their draft of the Great South Bay Management Plan, the Nature Conservancy has been pro-active in restoring New York’s waterways. They have led efforts to re-seed the bay with clams and monitor water quality. 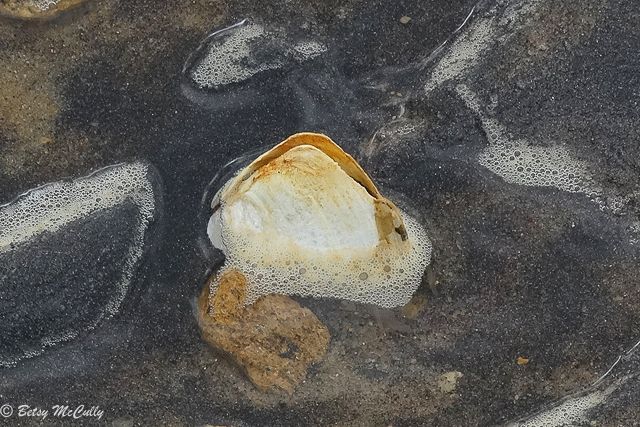 Restoration of the clams, considered keystone species because they act like water filters, will help restore the South Shore estuary. The Conservancy has also focused on restoring oysters, another keystone species; in 2002, they received a donation from the Bluepoints Oyster Company of 11,500 acres of underwater land in the Great South Bay. Today, the Eastern Oyster (Crassostrea virginica) is considered “ecologically extinct” in the Hudson-Raritan Estuary. Its restoration is considered vital to the health of New York waters, serving as natural water filters and shoreline buffers. In 2009, the New York-New Jersey Baykeeper and the New York-New Jersey Harbor and Estuary Program (HEP) formed the Oyster Restoration Research Partnership (ORRP). That same year, the US Army Corps of Engineers published their draft Hudson-Raritan Estuary Comprehensive Restoration Plan, calling for establishing 200 acres of oyster reefs by 2020 as part of their overall plan. In their final report of 2011, encouraged by the success of oyster planting, ORRP expanded their initial goals from 200 to 500 acres by 2015, and 5,000 acres by 2050. After Superstorm Sandy hit our shores in 2012, oyster reefs came to be seen as a critical buffer against such storms, protecting the city during our era of rising sea levels. In 2014, the NYCDEP received a grant of a million dollars from the Sandy Resiliency Grant Program to build more oyster reefs in Jamaica Bay. Beavers have occasionally been spotted in our region, as have their dams, but mating pairs are rare and noteworthy. In 2007, the first beaver to return to New York City built a lodge on the Bronx River, and after three years attracted a mate; in 2017, a beaver was sighted on Sherman Creek, the first known beaver on Manhattan in 300 years, and several months later another presumably different beaver began building a dam on Richmond Creek in Staten Island, cutting down 100 trees and creating a lake, a development that has not made human residents happy. The return of beavers is a testimony to cleaner waters, which is certainly the case with the Bronx River, a cause for celebration even if the beaver is not always welcome. Muskrats still build their thatch-like huts in fresh and brackish marshes, but their numbers are nowhere near their historical abundance. Otters may be making a comeback, as reported by Mike Bottini, who did a study completed in 2013. According to Bottini, otters were extirpated from their historical range in the eastern US by the mid-1840s; by 1990, they had repopulated eastern New York State, and in the last several decades, they have returned to our region, specifically Westchester, Connecticut, and New Jersey. They may be gaining a foothold on Long Island, according to Mike Bottini, whose surveys revealed their presence on Fisher Island, just 10 miles off of Orient Point on Long Island’s North Fork. 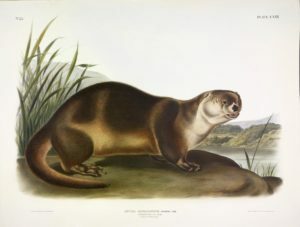 Otter (Lutra canadensis) by John James Audubon, Quadrupeds of North America, 1848, v. 3, no. 25, plate 122. University of Michigan Library Digital Collections. Waldman, John. Running Silver: Restoring Atlantic Rivers and Their Fish Migrations. Lyons Press, 2013. Waldman, John. Heartbeats in the Muck. Revised edition. New York: Fordham University Press, 2012.